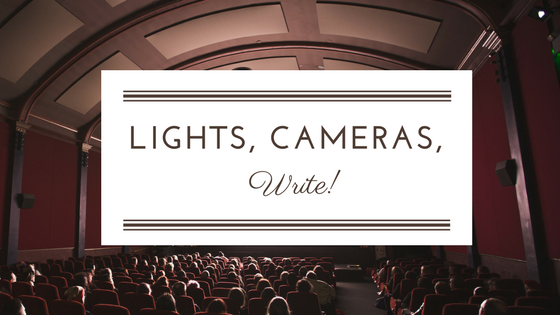 Rebellious Writing: Lights, Cameras, Write! You don’t have to follow the flow. The things that are good, are not always the popular things. I would be a fabulous actress, (I’m using myself just for an example). My family has always said so. But, I would not ever be in a movie, because of my standards and values. There are hundreds of movies out there. There are the movies that you watch and forget about them. There are the movies that are so terrible you wish you hadn’t watched, and you wonder why they made it. Then there are the movies that make you cry deeply, because they are so wonderful and beautiful, they are “the good ones”, “the classics”, and “the favorites”. Everyone should see the good movies, but there are precious few. I’m not saying I would demand being the heroine, on the contrary, even the good movies need villains, and I have a pretty good evil laugh. That’s not who I am, but acting is, well, ACTing. It is being someone who you are not. If I was an actress, I would be the most picky of them all. I wouldn’t ever: say any bad words, were costumes that were “skimpy” or uncomfortable, or do kissing scenes which went too far. After all, who likes those movies? If I really wanted to become an actress, I could submit to their rules, just to get into a movie. But, who would do that? I can become a nurse, writer, or anybody I want to be. When you are writing, write the books that make us cry. Write the books that make us think about what happens, write the books that bring joy to the reader. Write those books. Don’t give into writing the YA books which encourage all bad things. Aren’t we trying to make the world full of good, instead of bad? It’s okay, to use the bad things to teach a lesson, as long as they are shown as being bad. Not the “popular” and “cool” choice. People will read your book, and they will love it. This really resonates with some thoughts I've been having on books lately. Having the bad in a book is important. It's awesome to show it as bad. It's great to make the bad part of someone's personality, watching as such a character grows away from the bad and turns to the good. When do y'all plan on announcing the GR coordinator/moderator? Just curious since it's been a little bit since y'all announced your search. That is so true! The bad is definitely needed, as long as it is shown as bad! And watching charcters grow is the best. The characters that change, that improve, that turn good, those are the ones I will remember long after the book is finished. Pretty soon, I think. We have been discussing it. Yay!! great post, Clare (MC). :) Thank you for that! It was like a little pep talk. And this is why I'd like to write clean YA fiction most so that others like myself can have more fun, beautiful, uplifting stories to read and shape them. God bless you!! Thanks, Sarah! :) I'm glad that you liked it! Yes! I get so many story ideas, but I don't need to ruin them, I can make them better. Keep writing those amazing, beautiful books, Sarah! God bless you, too!!! I love the metaphor--fantastic job! I never could make it as a Hollywood actress either. I would probably cause "scandals" out the wazoo!